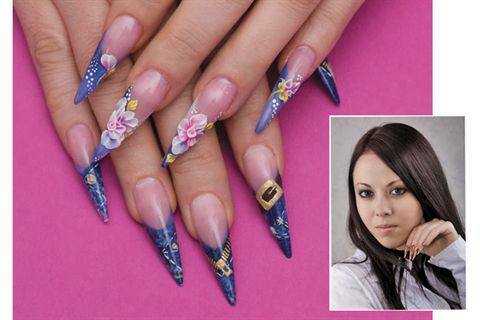 Ukrainian-based nail tech Liliya Sereditskaya is a relative newcomer to the nail craft. She’s only worked as a nail tech for three years, but she has quickly learned how to make stunning, high-quality stilettos to keep a full clientele. NAILS got a chance to talk to Sereditskaya about nail trends in Ukraine and how she got her start. NAILS: What do you use to make your designs? Do you favor acrylics or gels, or a mix? Sereditskaya: I work with every kind of nail material. In almost every one of my works there is acrylic, gel, and paint. NAILS: Do you paint or draw on anything else besides nails? Sereditskaya: Sometimes I decorate accessories like mobile phones, but only a few times. I really just concentrate on my nail skills. NAILS: So how did you get started working on nails? Sereditskaya: Since childhood I have bitten my nails, and my hands were always in a terrible state. People always told me to go to salons, but I always refused until I was 20 years old and agreed to go. At that time I did not understand the difference between acrylic and gel, and I did not care which material was to be used on my nails. Soon after I started doing nails myself, and I could not tell the difference between expert nails and nails made by a beginner. It wasn’t until I bought a nail magazine and got to see high-quality nails that I understood. The nails I was doing then were just awful, so I decided to take them seriously since that moment. NAILS: Do you work in a salon, or do you go to clients? Sereditskaya: At the moment I’m working at home and I have a nice room to work in. This year I was going to open a nail studio, but due to the financial crisis the opening was postponed.